Husband of Annie Mary Brown, of 1, Shingrig Rd., Nelson, Cardiff. Henry Brown was actually listed on early records as Harry Brown. His father, Samuel, came from Frampton in Dorset having been born there in about 1850. Samuel’s wife Emma was born in Cattistock in about 1852. Cattistock and Frampton are only about four miles away from each other. Samuel Brown was shown as a domestic groom living at Dorchester Road, Cattistock in 1881. The house number is not listed, but the adjacent entries in the register are shown as Rose Cottage and Mill Cottage. When Emma was just eighteen years old, she gave birth to the first of nine children. In 1891 the family are shown as living at School House, Cattistock, Dorset. By 1901, most of the children have disappeared from the household registry, Harry included. In fact, I can’t locate Harry (and be sure it is the right one) on any census returns for 1901. Harry’s parents are shown as living at a Cottage near Mill Lane. It is not clear whether this is the same address that they had been living at twenty years previous. While most of Samuel and Emma’s children had by now flown the nest, there is an addition to the family in the form of Clara Drew who was born in 1899 in Axminster. Clara is listed as the granddaughter of the head of the house, i.e. Samuel’s grand-daughter and Harry’s niece. I have no information about the father. Drew happens to be the maiden name of Emma Brown, Clara’s grandmother. By 1911, Henry Brown is a boarder, living with Robert and Rachel Thoms in Springfield Terrace, Nelson. His occupation is shown as mine repairer. (There is reason to believe Maiden Newton is the village that has been recorded as Maiden Norten and has possibly been mis-represented. 1. It is almost at the midpoint between Cattistock and Frampton. 2. There is to this day a road called Norden Lane in Maiden Newton. In September 2010, my wife and I visited Cattistock, trying to make some enquiries with any remaining Brown descendants. We spoke to several people in the village and none knew of any ‘Brown’ families living there. We then went to Cattistock Church and found the Cattistock War Memorial. 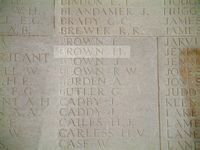 Upon it, I found the names of Henry Brown and his brothers William and Bernard Brown. William BROWN, Private 17068, 6th Battalion Dorsetshire Regiment. Born - Cattistock: Enlisted - Dorchester: Residence - Cattistock. Died - 12 April 1917 in France - commemorated in Bay 6, Arras Memorial, France. Bernard BROWN - Gunner 72112, ‘D’ Battery, 123 Brigade, Royal Field Artillery. Born - Dorchester: Enlisted - Guildford. In the field 10-7-16 – Dear Madam, I very much regret to inform you that your husband was killed in action on the night of 7-8 July 1916. He was a good soldier and has nobly done his work. I have no doubt that you will be somewhat consoled that he died fighting for his King and Country. I tender you my sympathies in your trouble and loss. A E Barton (Capt O.C. ), ‘B’ Company, 6th Dorsets.